House Republicans are poised to open the 114th Congress in January with a firmer hold on power than they have had since 1946. CNN projects that after all the ballots are counted, the GOP will end up with 246 seats, the same number it had after the first post–World War II elections, when President Harry Truman’s Democrats lost both Houses of Congress—which they had held since Franklin Roosevelt’s tidal-wave election thirteen years earlier. If the results of the 2014 election recall those of 1946, it is also true that the lessons the left took away from the earlier drubbing can perhaps help us understand what happened yesterday—and where to go from here. We can trace as if on a military map the retreat of the machine Democrats from advance positions which had become politically exposed into comfortable rearguard posts, sheltered behind the euphemistic camouflage of “bi-partisanship.” The Roosevelt era died bit by bit. 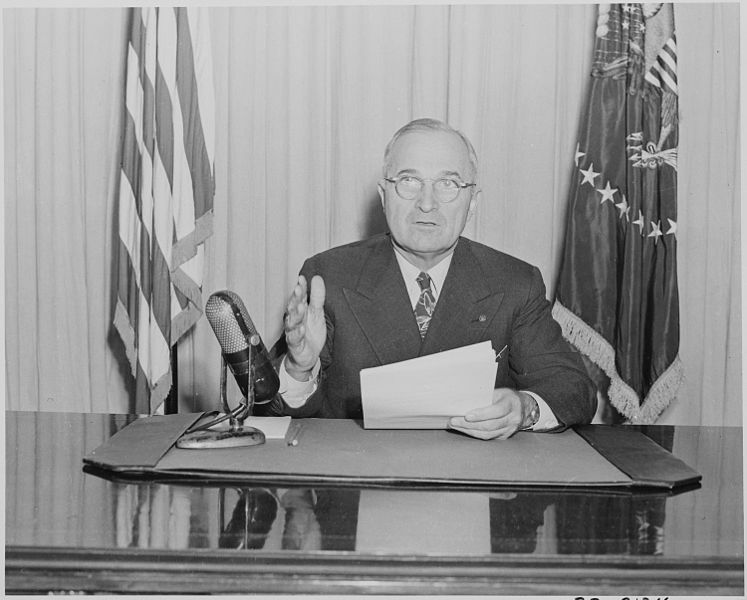 Now that it has been officially interred, despite the nominal survival of Mr. Truman, progressives are free to abandon both pretense and illusions and get to work laying the foundation for a new beginning. Democrats would have to look beyond Roosevelt’s program, beyond the New Deal, if they wanted to regain national support. Let us not fool ourselves in this hour of appraisal. The routed progressive forces in America are not equipped with a program or even prepared to unite on any program. They have emerged from the election reduced in strength, splintered and dispersed…. No common program; no organizational unity; no effective leadership. Defeated, they must start form scratch, for the fight they have just lost was only the start of a much tougher one ahead…. This was to be expected. Neither the reorientation of ideas demanded by the period we face nor the integration of forces on the left can be hastily improvised. Both will mean hard work by individuals and groups all over the country…In the pages of The Nation we shall analyze the practical as well as the theoretical problems that confront democratic Americans…. Attached to no man or party, we can comment without constraint upon issues and leaders, programs, parties, and strategies. Out of such discussions, in which we warmly invite our readers to join, we shall formulate as the weeks pass The Nation’s program for a new American progressive movement. During the last few days his friends have been trying to draw a new picture of Harry Truman. They are picturing a ruggedly independent man with no strings attached to him, a man who will act clearly and boldly for the good of the nation, let the chips call where they may. With or without a new Truman there will certainly be changes in downtown Washington. The exodus of men and women who worked under Roosevelt will be accelerated. None of them want to stay for the investigations by Republican-dominated Congressional committees and the lean budgets they must work with. Both the White House and Republicans, Coffin noted, were “wildly unenthusiastic” about the proposal. Another similarity between 2014 and 1946 is in the prevalence of small parties in New York state, where, a Nation editorial noted, “the minority parties of the left ran up impressive totals.” Today, we have the Working Families Party and the Greens battling it out for the third slot on the ballot; in 1946, it was the American Labor Party, the Communists and the Liberal Party. The Communists then, as the Greens today, “enjoyed a boost to almost twice their usual modest return,” The Nation reported. It was exceedingly shrewd of the Republicans to focus last week’s election on the question “Had Enough?” The returns indicate beyond doubt that the voters have had enough—but because of the magnificently calculated vagueness of the question nobody can say just what it is that has sated them. Have they had enough jobs, enough protection against the ups and downs of the business cycle, enough security for their bank savings, enough cheap electric power and land reclamation, enough freedom to organize in labor unions, enough cooperation with other nations in the promotion of world peace? Or have they only had enough of weariness after a long and bitter war, of vexations that are an inevitable part of the transition to peace, of that sagging of the spirit in high places and in low that marks the end of a monumental national effort? The Republicans are in power now and free to interpret the results as they choose. But in spite of the magnitude of their victory, they will be taking a long chance if they ignore the emotional reaction of a tired people in favor of a strictly political interpretation; if, in short, they flatly assume that they have a mandate to destroy the achievements of the Roosevelt era. They won control of Congress not because the country longed for Republicanism—whatever that might be—but because in almost every state in the country a vote for the G.O.P. was the only way in which a hazy discontent could be expressed. If he uses the veto, and the threat of the veto, with shrewdness and courage, he may get better results from an opposition Congress than from an undisciplined mob of legislators only theoretically controlled by his own party. He has the choice of taking a strong lead, with the hope of preserving the prestige of his office and his party, or of allowing the government to wallow for two years in uncertainty—with sure defeat at the end of the road and something like national paralysis en route. Curious about how we covered something? E-mail me at rkreitner@thenation.com. Subscribers to The Nation can access our fully searchable digital archive, which contains thousands of historic articles, essays and reviews, letters to the editor and editorials dating back to July 6, 1865. Back IssuesGuided tours through the archive of America’s oldest weekly.